iXWebHosting may seem more attractive to you when it comes to hosting on its WordPress hosting pack. The reason is very simple because you’ll see that the WordPress hosting plan of iXWebHosting comes with a ton of awesome services. In this post, I’ll bring the WordPress hosting plan of iXWebHosting to review it thoroughly. I think that there’s no need to talk about WordPress since most of you know about the CMS well. So, I’m only discussing the WordPress hosting plans of iXWebHosting. Unlimited storage and bandwidth. The WordPress hosting plan of iXWebHosting provides an unlimited storage and bandwidth features. These mean that you won’t have to worry about storing a high amount of content and data transfer. Fully WordPress compatible. The hosting company, iXWebHosting, provides a 100% compatible hosting plan for WordPress. Multiple domains for free. One of the exciting features of the hosting plan is this. Yes, iXWebHosting WordPress hosting plan comes with 3 free domains which seem very much attractive. 1-Click installer for WordPress. To install the WordPress CMS easily on your hosting plan, iXWebHosting provides a 1-click installer. Using the tool, you could install WP within a short period of time. Multiple dedicated IPs. The hosting plan allows you to use up to 15 dedicated IP addresses. 99.9% Guaranteed uptime. 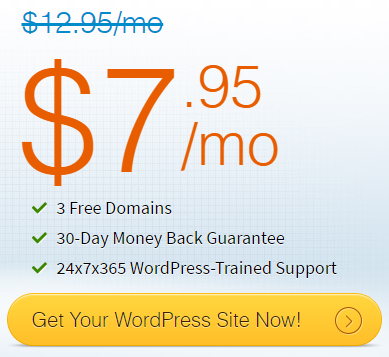 There’s a 99.9% uptime guarantee comes with the iXWebHosting WordPress hosting plan. Skilled support. If you face any trouble running your site that’s hosted on this hosting plan, then you have the room for getting an expert support from the hosting company. Money-back guarantee. Providing the 30-day money back period gives you the chance of getting your money back that has been spent on buying the hosting plan. This makes your purchase risk-free. So, buy the hosting plan anytime you want and if you don’t like the services, then claim your money back within the 30-day period.